A bucket of sticks in the mud is a glorious sight this time of year! I will not be planting any roses, or any bare root plants for that matter. Boo hoo! I miss my roses. I do not really need more. There are more important things to grow. I put a strict limit on how many roses I would waste resources on. There are only a few more that I would get if I ever find them. That is how most of us do it. I just do not like so many of them. I like all the simple ‘plain’ colors, like ‘John F Kennedy’, ‘Proud Land’; you know, perfect white. perfect red, perfect yellow and so on. I dislike ‘Double Delight’! I only happen to like ‘Seashell’ because I grew up with it. (I can not find it now.) Anyway, I do not like many of the other roses outside of my favorites. I don’t know why. I have three bare root roses heeled in, one pot each..next year I can afford to be a bit more casual! Ooh. Is it paper or electronic? Agree with you on the edgeworthia! But I don’t know what it is! Not very good on trees/shrubs! I can’t say I’m very good at identification either. If it’s in my garden, I know it by where it is. If it’s not, I know it by the blossom. Very sophisticated, you see. I had already seen the picture of your snow hat on the Edgeworthia and it‘s a very beautiful one! Do you know the name of your tiny tulips? So Cute! The yellow in the garden here is provided by a Kerria japonica (bit of a vigorous thug if I’m honest but very welcome flowers in spring) and miniature tete a tete daffs which come out among the hellebores every year. Personally, I’m very glad the snow has gone, all 3 inches deep of it, there’s work to be done! I love your crocus ‘Tricolor’ too. Very beautifully photographed. Your Edgeworthii is very beautiful in the snow and I love those tricolour snowdrops! All I have asked for for Mother’s Day is a few hours to prepare for and plant my bare root roses! I love the snow hat on the Edgeworthii (never come across that plant before, but it looks stunning!). 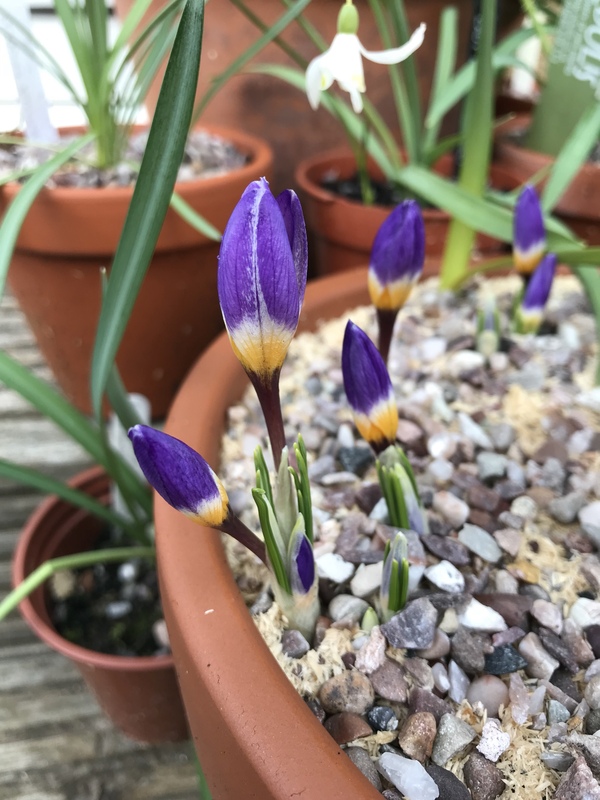 The tricolour Crocus looks equally great. Glad someone got in a thumbs up for the crocus, that is choice!